My class will be based on Cunningham Technique. Cunningham Technique was devised by Merce Cunningham to realise his choreographic aesthetic. I studied it while in the States in the '70's and taught Limbs company class in this technique for the first few years of Limbs existence ( the technique only, I was much more theatrical in my choreographic aesthetic) until we brought in Dorothea Ashbridge to teach ballet in 1980. It incorporates the rigor of ballet, especially the leg work but without the courtly (posh) style and the added challenge of a complex awareness of the torso with isolations of the lower, middle and upper back. It assists the dancer in awareness of the torso placement, with moving light and fast, requiring a super strong core, so to be able to balance, make sharp direction changes, light ballon (jumps) all these combined with the honesty and weight of contemporary dance.It's a technique still used today by many major contemporary dance companies such as Random and Rambert. As part of the class I plan to teach the opening sequence from In Flagrante as it involves the use of the torso as in Cunningham technique. Mary Jane O’Reilly has had a professional career in dance spanning over 25 years both in New Zealand and internationally as a dancer, choreographer, teacher, Director and Producer. She was a co-founder, dancer and choreographer with the Limbs Dance Company (1977-89) and held the position of Artistic Director from 1979 to 1986. 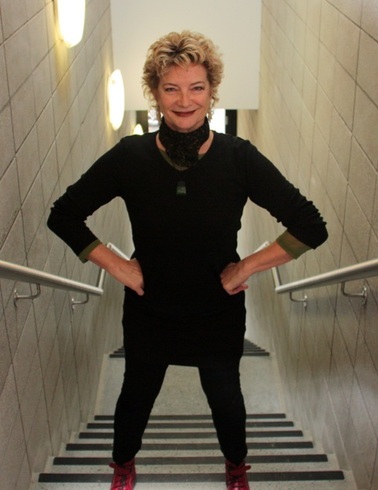 Her events included the choreography of the Opening Ceremony of the Commonwealth Games (1990) involved a cast of 6000 and the Millennium Dawn event in Gisborne(2000) and she founded and directed the Auckland Dance Company (1996 - 2001). She has received numerous grants and awards including the $30,000 Allen Highet Award (1984) for outstanding achievement by a mid-career artist and was awarded a Queens Service Medal for her services to dance in 1990. As a dancer she trained from childhood in ballet, jazz and later in contemporary dance and as a choreographer has created over 60 original works for Limbs Dance Company, Auckland Dance Company and other dance companies both in NZ and offshore, including ‘Jean, the ballet of Jean Batten’ (1990) the first original three act ballet ever commissioned by the Royal New Zealand Ballet. As a teacher she has trained internationally acclaimed dancers and choreographers Mark Baldwin (Dir, Rambert Dance Co , UK), Kilda Northcott (NZ), and Douglas Wright (NZ) and as a videographer has created 9 original videodance works. She was recently awarded a best editing prize for her latest dance video work ‘Canopy’. In 2001 she produced and directed a sellout Limbs Retrospective performance series and in 2003 she created a thirty minute dance element for the Auckland Choral Society’s 2003 presentation of ‘St Matthews Passion’ at the Trinity Cathedral, Auckland.